Renowned for its technical and creative independence appreciated by customers endowed with a similar character, JEANRICHARD presents an original newcomer to its Diverscope collection. After the initial titanium versions, this is the first model in the line to be presented with its distinctive cushion-shaped case made from polished and satin-finished stainless steel. The solid caseback is secured by four screws which, together with the screw-lock crowns at 9 and 3 o’clock – respectively controlling the hour&date and the internal bidirectional rotating bezel – guarantee water resistance to the respectable depth of 1,000 feet (300 metres). This robust and reliable sporty model is powered by a 26-jewel automatic JR 1010 movement, based on the in-house made JR 1000 movement launched in 2004 and successively enriched since then with nine different evolutions. 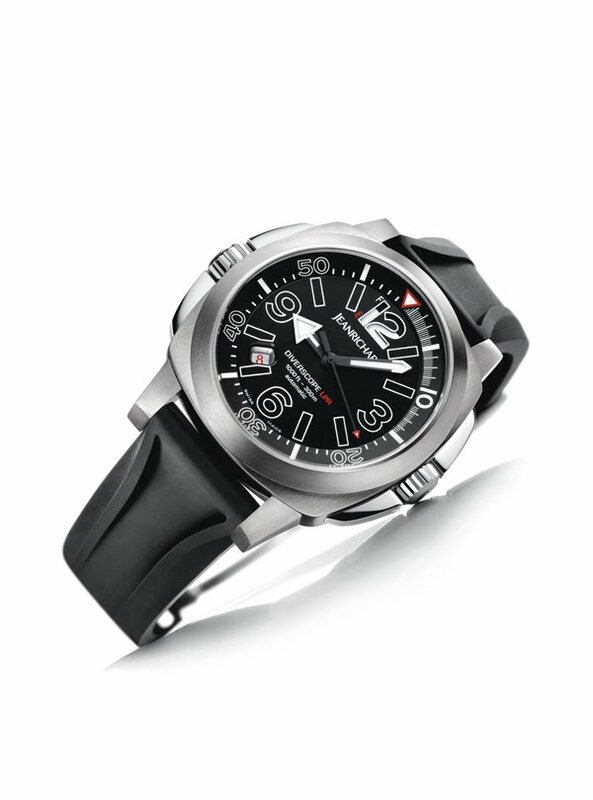 It features a balance oscillating at a frequency of 28,800 vibrations per hour and ensuring a 48-hour power reserve. The extremely readable opaline black dial features a date display at 7.30, black & white hour and minute hands filled with a luminescent substance, along with luminescent-rimmed hour-markers and Arabic numerals. Among the latter, the number 12 stands in a particular way, since it empties and fills to provide a highly original linear power-reserve indication from which the model draws its “LPR” code name. Like many successful designs, the technique behind this distinctive aesthetic and technical feature is surprisingly simple: a plate covered with a luminescent substance is linked to a cam via a conveyor support and a connecting rod, and this plate rises successively as the movement is wound and the numerals become white – meaning the power reserve is full. Much like a petrol gauge, this linear power-reserve then vividly displays the gradual depletion of the energy supply. Delivered with two straps – one in rubber and the other in a Kevlar® fabric – fastened by a satin-finished folding steel clasp with a double pushbutton security system, this is a watch clearly built for action and ready to accompany sports enthusiasts in their accomplishments both underwater and on dry land.